Last month we took a quick trip to Seattle to visit some good friends. While riding on the ferry to their house, I spotted a woman with a very unique coffee cozy. It was made of fabric and was pretty cute. Of course the environmental genius was not lost on me. 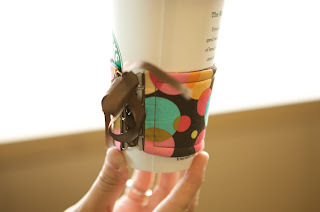 If you can't always have a reusable cup with you, at least you can keep a spare coffee wrap/holder in your purse! The woman on the boat let me take a photo of her cup and told me she bought it from somewhere in Minneapolis. I can't find the shop she mentioned, but did find so many resources online with a big variety of styles. People call them many different names (coffee cozies, collars, wraps, sleeves), some have ribbons to tighten the fit, some are knitted, some are plain fabric, some are quilted. Etsy, the homemade-crafting-wonder-shop, is a great place to start looking. It seems as many ways to go about making one yourself as there are free patterns and tutorials online. What a great gift idea! (Hint hint, wink wink). Remember, it's always best to bring your own mug. But if you forget, have your own cozy handy. **update: I think the cozy in the photo is from The Cozy Corset Cuff. Wait, is that also a bracelet? It's like crafty coffee vambraces! Thanks for featuring our cozy! What an honor! Yes, they can be worn as wrist cuffs if your wrists are big enough. I can't wear them as I have freakishly small wrists, but my partner often wears hers when she isn't using them on drinks. I bought one at www.cafesleeve.com Cheapest coffee sleeves I've researched. And, when I walked into Starbucks with mine on my cup (they give 50 cent refills now), the manager at Starbucks said, "This is the best sleeve I've seen so far." Cafe Sleeve rocks and they're not too "girly!"